The rechargeable Typhoon ActionCam combines the self stabilizing camera gimbal with a handle for smooth ground footage. The included CGO3 camera has an impressive 4k resolution, 12 megapixel photos and slow motion 1080p/120fps video. 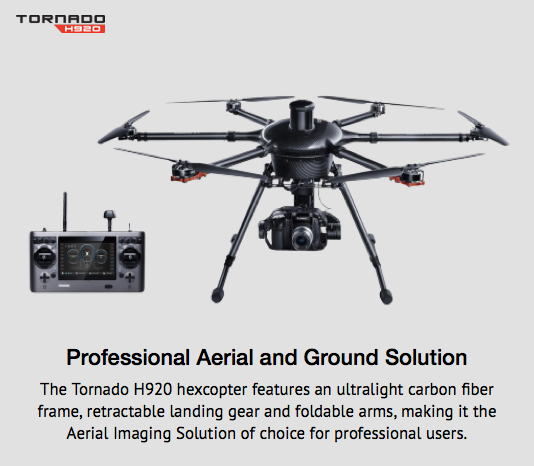 The Tornado H920 is a professional multirotor aerial photography and videography platform. Its unique modular design and innovative features make it possible to capture impressive photographs and video footage for a variety of uses. For your convenience, it is compatible with two camera options: the industry standard Panasonic GH4 and Yuneec’s CGO4 gimbal camera. Not only is the ST24 an advanced 24-channel 2.4GHz RC transmitter – it’s a personal ground station that includes built-in hardware and functionality for a 5.8GHz video downlink, 7-inch touch screen display and built-in Android powered tablet. With the convenient and portable ST24, it’s no longer necessary to use separate components to view real-time video and telemetry data during flight.